What started a year ago as a guide to a single borough in New York has turned into the global phenomenon that is On The Grid City. 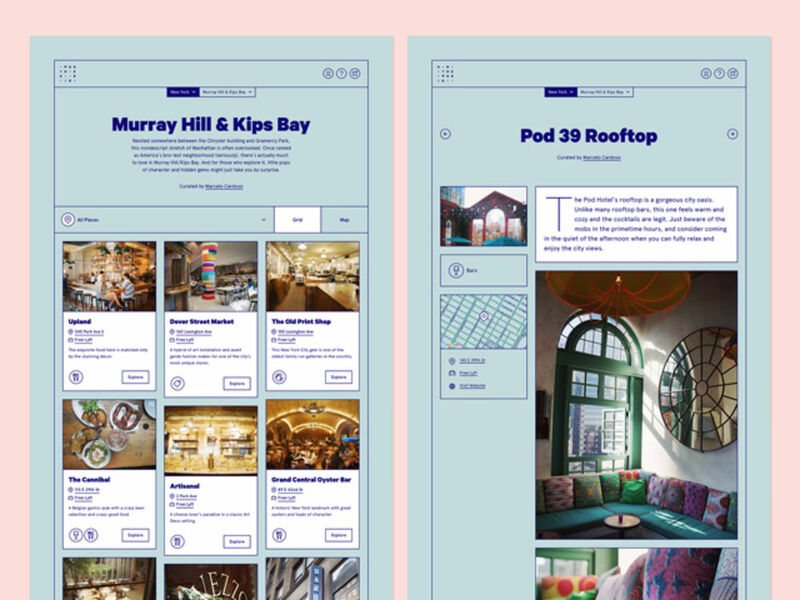 We catch up with founders Hyperakt to get the lowdown on the ultimate designer city guide. If you're heading off on your travels, or just fancy a spot of armchair tourism, a visit to On The Grid City will open your eyes to a world of good stuff. 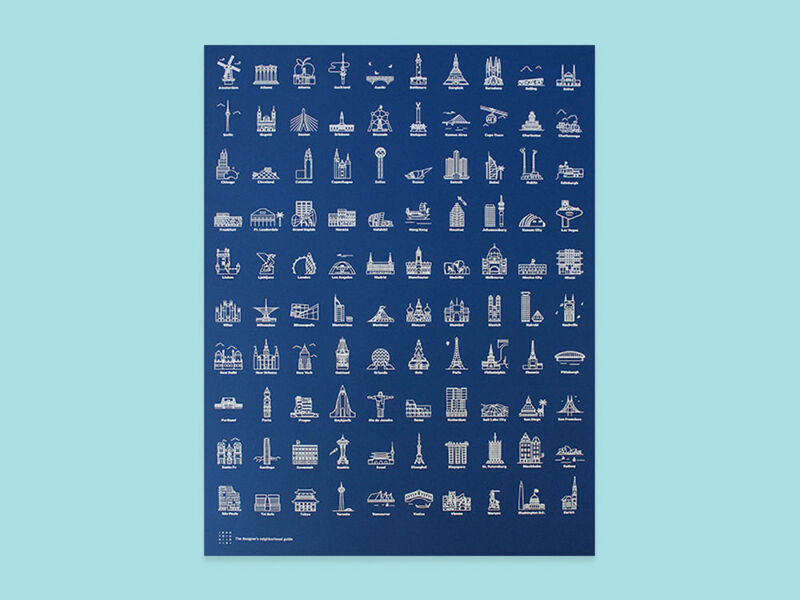 It's a city guide created by designers for designers, and anyone else interested in the idiosyncratic places that give cities their own distinct character. With ambassadors in most of the major cities, and a team of hand-picked curators taking care of the boroughs within, it's rapidly becoming a vital global resource. We caught up with founder and head honcho at NYC agency Hyperakt, Deroy Peraza, to find out how On The Grid City became a reality. We love On The Grid City here at Grafik. How did the idea first come about, and how did you go about actually making it happen? Thanks...We love seeing how it has grown. The idea came up in September of 2014 as we were about to move our studio down the street from our Brooklyn home of ten years in Carroll Gardens to Gowanus. Eric Fensterheim, one of our designers at the time, had the idea of creating a guide of all the hidden gems in the neighbourhood to commemorate our move and try some things our clients probably wouldn’t let us try design-wise. We designed it and built most of it that month, but then between the move and the holiday rush, we got super-busy. We didn’t get back to it until March of this year. We sprinted on it for a few weeks, designed some branding, ironed out the bugs, photographed and wrote about the places in our neighbourhood and put it out into the world in mid-April. By May we had a few other studios – early believers – ready to launch their neighbourhoods. By July, we launched the first neighbourhood in our second city, Los Angeles. From there on out, people started reaching out wanting to get involved. Designing the site backwards was an interesting one. 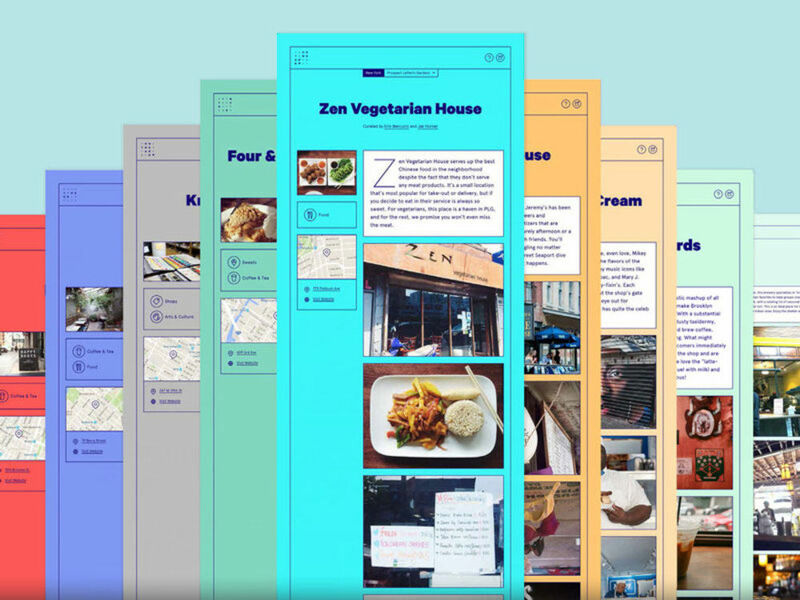 When we launched we just had one neighbourhood – Gowanus, Brooklyn, where Hyperakt is based – so our homepage was the neighbourhood landing page. 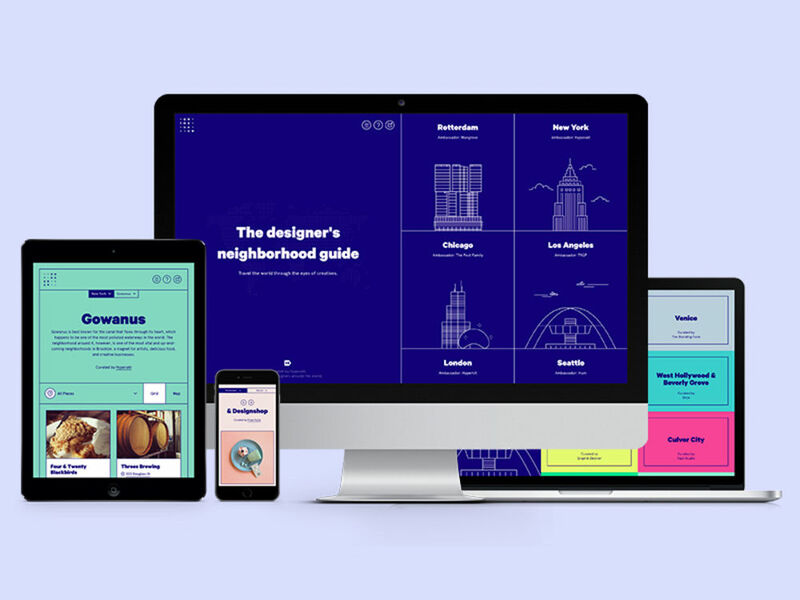 The city landing page for New York was next, giving you access to multiple neighbourhoods in one city. Lastly, the world landing page, giving you access to multiple cities, was added. Handling the massive amounts of communication that managing a community of this size requires a high level of organisation. There are a lot of logistics in play and over 100 shared spreadsheets that we use to communicate with all of our Ambassadors. It’s a lot. Were you surprised at how quickly On The Grid City has captured people’s imaginations? When we originally brainstormed this thing together we thought about the potential for it to become bigger if we designed it in such a way that we’d be able to invite friends to curate other neighbourhoods. Our pie in the sky goal was to cover the creative neighbourhoods in New York. We never dreamed that a year later we’d have 100 neighbourhoods in twenty-five cities launched and hundreds more in the works. It’s been completely mind blowing. Apparently, we weren’t the only ones craving a designer-curated neighbourhood-centric travel guide. So far we’ve received over 400 applications for city Ambassadorships. How often is the city info updated? We release eight to ten new neighbourhoods (in different cities) every Friday. We update the site with new Ambassadors and Curators daily as we lock them in. Is there any limit on the number of cities you can include or is the plan for worldwide coverage? If so, won’t that break your server? Worldwide, baby...We now have over 100 City Ambassadors and we’re still going. If that breaks our server, we’ll figure out how to fix it. Are you planning on keeping things totally online, or might On The Grid City manifest itself as an app or even physical guidebooks one day? We’re exploring all kinds of stuff. We hope to have the app done by early next year. We’ve already designed and prototyped it. We also hope to do printed books starting next year. We’ve done initial prototyping of those as well. There’s a lot more to come. What have you got planned for your ‘shop’ section, might we see a range of locally designed city-specific products? The plan is to make it 'The Designer’s Gift Shop'. We’ll sell On the Grid swag, but we’ll also sell stuff created by our Curators and Ambassadors. Many of them already sell prints, apparel etc, through their own site. We want to bring it all together into a curated shop that reaches a wider audience. This will hopefully give everyone involved more exposure. There is strong interest in our community to participate in the Gift Shop, we just have some details to work out before we launch it. Has On The Grid City challenged your preconceptions of certain places? Any plans to relocate? Completely. Honestly, I started the project with a preconceptions that very few cities had the kinds of places that are On the Grid. I’ve been surprised by cities like Columbus, Atlanta and Houston so far. They weren’t on my radar at all before On the Grid and now I have a totally different perception of them. Many of the Curators say that there have been huge changes in their cities over the last few years and that tons of new places have opened. It really goes to show that you no longer have to live in a cultural capital to enjoy some of the finer things in life, like a great cappuccino or a well-crafted cocktail. This is just the beginning, though. There are many surprises in store as we launch more cities.